At left, a 1983 magazine cover featuring Elizabeth Molak in Italian Suite. Photo of Brooke Huebner on right by Elizabeth Molak-Huebner. In Her Mother’s Footsteps	A ballet senior performs an unforgettable final showcase. In April, Brooke Huebner BA’18 gave her final U student performance, which for her had a sentimental flair. She had been preparing for that night’s School of Dance Ballet Senior Showcase for months after having received special permission from The Gerald Arpino Foundation to perform an excerpt from Italian Suite. She would be dancing the same choreography that was originally created for her mother, Elizabeth Molak-Huebner, a former dancer with the prestigious Joffrey Ballet. Brooke grew up immersed in ballet. She spent her youth at her mother’s ballet studio in California, the Classical Dance Center, which Elizabeth founded 24 years ago. As with her mother, ballet was virtually all Brooke ever knew and wanted to do. “My mom raised me and my sisters at the studio; we basically lived there,” says Brooke. She notes that her mother never pressured her into ballet and even encouraged her to try other activities and sports, but they just didn’t have the same allure. Brooke wanted to dance, like her mother. Training with Elizabeth for the Italian Suite allowed her to do just that. “Learning this [dance] from my mom, I wanted to match every single body movement and pose in the piece, but that is just not possible. We are two different people, and yes, I danced the same movements as her, but I found a way to make them my own,” Brooke explains. 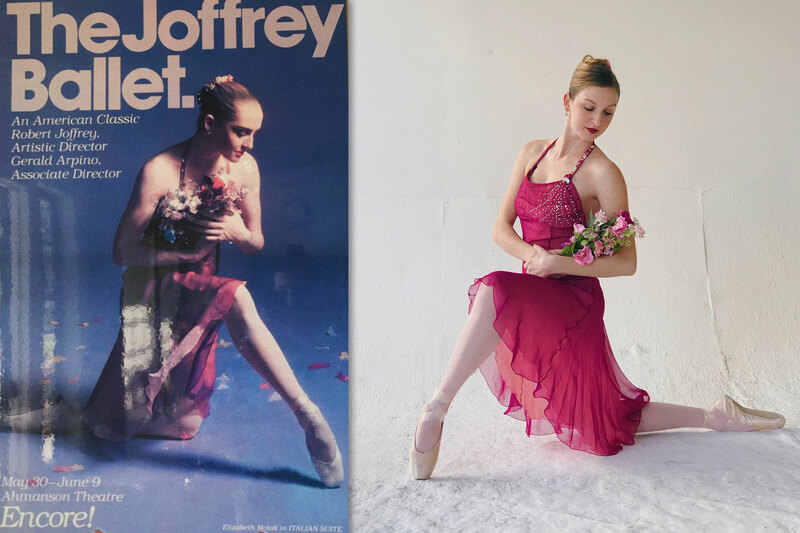 Elizabeth received a full scholarship to the Joffrey Ballet School at the age of 15, then was accepted into the Joffrey II at 16 and promoted into the main dance company at 18. She promptly found herself called into private rehearsals with Gerald Arpino, the co-founder of Joffrey Ballet and its resident choreographer, creator of more than a third of the company’s dances. Elizabeth had also begun her training with her own mother, Brooke’s grandmother Rosemary McCarter. Rosemary was a classically trained ballet dancer and spent time abroad studying at the International School of Ballet. Both of her daughters, Elizabeth and Celeste, were eventually members of the Joffrey Ballet. Rosemary witnessed Elizabeth perform the original Suite in 1983 and was also in attendance for her granddaughter’s senior performance. “Knowing my mom and my entire family were in the audience, including my aunt and my grandma, made me turn on so much extra energy onstage,” Brooke recalls. After graduating from the U this spring, Brooke returned to California for the summer to train, teach, and choreograph at her mother’s studio. In August she began training with the Nevada Ballet Theatre and choreographing for an upcoming ballet competition, though for her nothing can quite top the experience of dancing in her mother’s footsteps. —Julie Hirschi BS’17 is former editor of The Daily Utah Chronicle.